The original inhabitants of Venda are Vhangona, and Vhambedzi. Vhangona are estimated to have settled in Venda as early as the 6 th century. It is also believed that about 85% of present day Tshivenda words and vocabulary come from the original Tshingona. According to one version of Vhangona oral history, the capital of Vhangona was Mapungubwe with the Raphulu Royal House as the most senior royal house of the Vhangona. According to this version the Vhangona Kingdom was made of +-145 chiefdoms. Districts consisted of chiefdoms which were governed by Vhamusanda (Junior Chiefs) who paid tribute to Mahosi. This tradition states that one of the Vhangona Kings was King Shiriyadenga whose royal kraal was at Mapungubwe. It is not clear if this Shiriyadenga is the same Shiriyedenga of the Sanga dynasty, a Karanga-Rodzvi branch. The Sanga dynasty, in Zimbabwe’s eastern highlands, was founded by Chiphaphami Shiriyedenga who died in 1672. Different clans such as Vhatwanamba, Vhatavhatsindi, Vhanyai, and Vhalembethu settled in Venda from around 1200. Vhatavhatsindi settled in present day Thengwe, Tshiheni, and HaMabila. Vhatwanamba settled in present day Mapungubwe, Musina, Ha-Tshivhula, HaMadzhie, Ha-Matshete, Ha-Mulambwane, and Ha-Lishivha. Vhalembethu and Vhanyai settled at Ha-Mutele, and Thulamela. These groups did not seek to impose their rule over all Vhangona. The clan that conquered Venda and went about imposing its rule over every clan it found in Venda was the Singo (also known as Vhasenzi). The Singo are believed to have settled in Venda in the early 1600s. The Singo were accompanied by Vhalaudzi, Vhandalamo and Vhalemba. The Singo fused all clans in Venda into one nation known as Vhavenda. But how did the Singo manage to conquer and subjugate all clans in Venda? According to the Singo tradition, the Singo came from the Great lakes in Central Africa (present day Democratic Republic of Congo, Burundi, Rwanda and the western side of Tanzania). This tradition states that the Singo had a magic drum known as Ngomalungundu. This was a sacred drum of Mwali (Mwari), the Great God of the Singo. Ngomalungundu was the spear and shield of the Singo. Mwali is believed to have worked miracles with this drum which had magic and killing powers. In fear of Ngomalungundu, other groupings surrendered to or fled from the Singo killing powers. It is said that the Singo king, when they were in Central Africa, was Tshilume (Ratshilumela). His royal kraal was known as Matongoni. He is said to have been instructed by Mwali to move southwards. Mwali told him that he should use Ngomalungundu to subjugate the people whose land he would conquer. 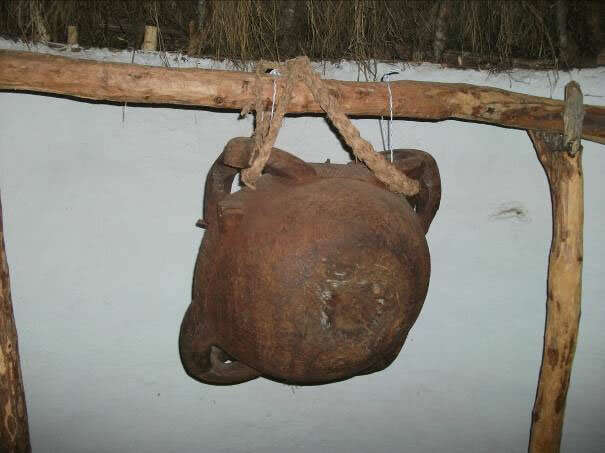 A replica of Ngomalungundu, Dzata Museum: Dzata. The leader of the Vhandalamo was the custodian of Ngomalungundu. Ngomalungundu was, according to Mwali’s instructions, not supposed to touch the ground. It was supposed to be carried by six Vhandalamo or Vhalemba men when moving from one place to the other and when the Singo were in combat. It was also, when not being moved or used, supposed to be placed safely at a place where it would not touch the ground. Tshivhi ndi ndau khulu. Yo ofhiwa nga vhanna, ya vhulawa nga vhasadzi. Yowee! Vhanna vho ladzwa lwa u sa vuwa nga Ratshilumela wa Mwali”. The Singo forgot that they were supposed to move to the south and settled permanently in Vhukalanga. They even intermarried with Vhakalanga and Vhanyai. This incensed Mwali and he punished the Singo by sending lions to kill a lot of people, including royal princes and princesses. King Tshilume went to Mount Mubvumela to perform religious rituals to appease Mwali, but he never returned. After some days Mwali is said to have summoned vhotshifhe (high priests) to Mount Mubvumela. There he told them that Tshilume would not be coming back since the people had disobeyed Mwali’s instructions by intermarrying with Vhanyai and Vhakalanga and settling permanently amongst them. He told vhotshifhe that Tshilume’s only surviving son should be the new Singo king. He was given the title of Tshikalange since he was crowned king of the Singo in the land of Vhakalanga. The Singo moved southwards and reached the banks of Vhembe River (Limpopo River). They settled in the Vhembe valley awaiting further instructions from Mwali. Unfortunately King Tshikalange died of malaria before crossing to the other side. Mwali instructed vhotshifhe to install one of Tshikalange’s sons, Hwami , as the new king. Hwami led his people across the Vhembe River and settled in the Nzhelele valley. Hwami’s royal kraal was on Mount Lwandali and was known as Dzata (known today as Dzata I). Hwami subjugated most Vhangona clans including their king, Raphulu. Hwami was, according to this version, succeeded by Dimbanyika. Dimbanyika was a hunter. One day he went out hunting but never came back. But his two dogs went back home. A search party, led by one of his dogs, was dispatched the following day to look for him. The dog led the search party to a cave. The opening of the cave was filled with huge rocks which were impossible to move. After trying unsuccessfully to move the rocks, they were addressed by Dimbanyika. He told them to stop trying and that the cave would be his grave. He instructed them to take Ngomalungundu and move the capital since nobody would be allowed to live on Mount Lwandali. He forbade people from eating fruits from Lwandali. He also gave instructions that the son of Rambwapenga and his descendants must remain on Mount Lwandali to tend his grave and to be guardians of Lwandali. Lwandali became known as Tshiendeulu, meaning royal graveyard. The son of Rambwapenga and his descendants became known as Netshiendeulu, meaning the owner/ruler/custodian of Tshiendeulu. The Singo moved to the south west of Lwandali and built a new capital, Dzata II. Up to this day the descendants of Dimbanyika are not allowed to face the descendants of Netshiendeulu since it is believed that the descendants of Netshiendeulu possess supernatural powers bestowed by Dimbanyika. When Khosi Netshiendeulu goes to Dzanani to pay tribute to the Mphephu-Ramabulana King the two have to converse not facing each other. They are also separated by a wall, and they both need to have their backs against the wall that separates them. This practice is also due to the belief King Dimbanyika and the son of Rambwapenga (Netshiendeulu) could not see each other when Dimbanyika was trapped in the cave, and when he was issuing instructions. The Mphephu-Ramabulana King is also, therefore, supposed to issue instructions to Khosi Netshiendeulu without the two seeing each other’s face. Dimbanyika was succeeded by Dyambeu. The remaining Vhangona clans, Vhambedzi and Vhalembethu of Ha-Mutele and Makhahani (Thulamela) were also conquered. Dyambeu died when he was attempting to subjugate the Vhatavhatsindi of Tshiheni and Tshiavha (where Lake Fundudzi is found). Dyambeu is said to have underestimated the Vhatavhatsindi and decided to subjugate them without the use of Ngomalungundu. He, therefore, instructed the six Vhandalamo men who carried Ngomalungundu to hang it on a plum tree. Ngomalungundu is said to have fallen from the plum tree, touched the ground and cracked while the Singo were busy fighting the Vhatavhatsindi. This led to the defeat of the Singo by Vhatavhatsindi, and the broken Ngomalungundu was taken by the Vhatavhatsindi. King Dyambeu was killed. This was the first defeat of the Singo by any of the Vhavenda clans. Vhatavhatsindi took Ngomalungundu to their royal kraal, Tshiheni. Mwali, the Great God of the Singo made contact with Tshishonga, the Chief Priest and gave him a golden pipe which had similar powers to those of Ngomalungundu. Tshishonga led the Singo army to conquer Vhatavhatsindi. The Singo army set up its base camp at a place known today as “Mudavhi wa Tshishonga” (Tshishonga’s field). The Singo army defeated Vhatavhatsindi with the help of the magical golden pipe given to Tshishonga by Mwali. The Singo also managed to get hold of Ngomalungundu and took it back to Dzata. Through conquest the Vhangona and Vhambedzi came to revere and fear Ngomalungundu. They regarded this drum as the Voice of their Great God, Raluvhimba. By the late 19th century Vhavenda had to come to think of Raluvhimba and Mwali as interchangeable names for the same deity, although they had once been separate. The Singo were, with time, absorbed culturally and linguistically by Vhangona and Vhambedzi clans, the clans they conquered. The conquerors’ descendants owe much of their present identity to the earlier inhabitants of Venda, Vhangona and Vhambedzi. It is believed that about 85% of present day Tshivenda words and vocabulary come from the original Tshingona. But the conquerors also transmitted a great number of Karanga traits. Today nobody knows where Ngomalungundu is. Some say that King Thohoyandou took it with him when he disappeared without trace. Some people believe that Thohoyandou crossed the Vhembe River into Vhukalanga, and that is where he died. 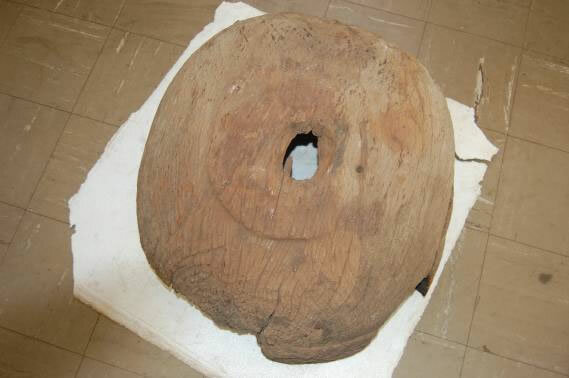 A museum in Harare, Zimbabwe, has the remains of an old drum, and the curator claims that it’s Ngomalungundu. The curator says that the drum was donated to Bulawayo Museum by a Venda-speaking man in the 1930s. The remains of an old drum at Harare Museum. The curator says it’s Ngomalungundu. (picture courtesy of Mr Charles Mphephu).